Can you Reheat Ground Turkey? | Can You Reheat? Can you Reheat Ground Turkey? I have recently switched to using turkey in place of burger, so I am a little unclear of any differences in the storage of ground turkey. I had made some turkey burgers last night for dinner, and when I went to reheat it today, I got a little leery because I have never done it before. Can you reheat ground turkey? 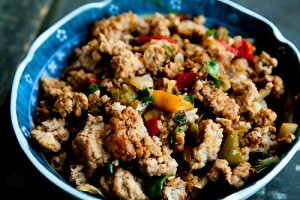 Yes, ground turkey is safe to reheat as long as you bring it up to 155 degrees F and maintain that heat for 15 seconds. This will ensure that most of the bacteria that like to reside on food is killed. You can use the oven, skillet, or even the microwave to reheat your ground turkey meals. The oven is great for reheating casseroles, burgers, and other rather “clean” dishes. For burgers, wrap in foil and place in a preheated, 350-degree oven, right on the rack. Your burger should be heated through in about ten minutes. Use a meat thermometer to check for accuracy. Casseroles are rather easy, ensure they are in an oven-safe dish, and bake until bubbly or the core of the dish is at the 155-degree mark. Burgers and ground meat are the most common dishes to be reheated in a skillet. For both, you will want to cover on medium-low heat until the meat is heated all the way through and is loose. For the burgers, you will need about 3-4 minutes per side, depending on how dense the patty is. Another common dish made on the stovetop is ground turkey chili, to reheat that, simply place your serving in a stove-top safe pot and heat over medium-low heat until it is warmed through and bubbly. There comes a time where we all stand in line at the microwave at work, and lucky for you, reheating your ground turkey based dishes shouldn’t take more than three minutes, depending on the food. Burgers– May requires 30 seconds per side, be sure to flip to ensure you are not overcooking it. Cheese/Noodle Based– Microwave on high for 45 seconds, covered. Stir, and microwave again for another 45 seconds, stir. Check for desired warmth all the way through your meal. Microwave for longer as needed. Chili– Microwave on high for one minute, 20 seconds, stir. Depending on how thick you made the chili and if it is still very cold from your storage, it may take another minute or two to bring it up to the desired temperature as beans love to absorb heat. Ground turkey is one of the best alternatives to beef, and you can hardly tell a difference. A hearty meal made with turkey is just as satisfying as beef. Now, you don’t have to be limited to what you can find on your way to work, use one of these quick methods to make ground turkey a part of your dinner making arsenal!